Boston begins a best-of-five playoff series in Houston on Thursday. In winning eight more games than the Boston Red Sox this year, the Houston Astros also scored 111 more runs. That difference is a major reason why the Astros are favored in their best-of-five American League division series starting at 4 p.m. Thursday in Houston. While Houston explodes on offense, Boston’s bats can disappear. The Red Sox were shut out 10 times, and will face the likes of Justin Verlander (Thursday) and Dallas Keuchel (Friday). Verlander is on a roll since his trade to Houston (5-0, 1.06 ERA). In the past three years he’s 2-1 with a 1.42 ERA against Boston. And remember the 2013 ALCS, when Verlander held Boston to four hits and one run over eight innings? Keuchel has a 0-1 record (9.98 ERA) against Boston, but that’s deceiving because it covers only three games (two starts), none of them coming in his Cy Young season in 2015, or this year, when he’s 14-5 with a 2.90 ERA. Verlander and Keuchel, plus Houston’s offense, mean trouble for the Red Sox, who suffered a three-game sweep in last year’s ALDS against Cleveland. 1. Boston’s young players are more experienced than in 2016. Xander Bogaerts (25 years old), Jackie Bradley Jr. (27), Mookie Betts (25 on Saturday) and Andrew Benintendi (23) all played in the 2016 ALDS. Only Benintendi shined (3 for 9, double, home run). 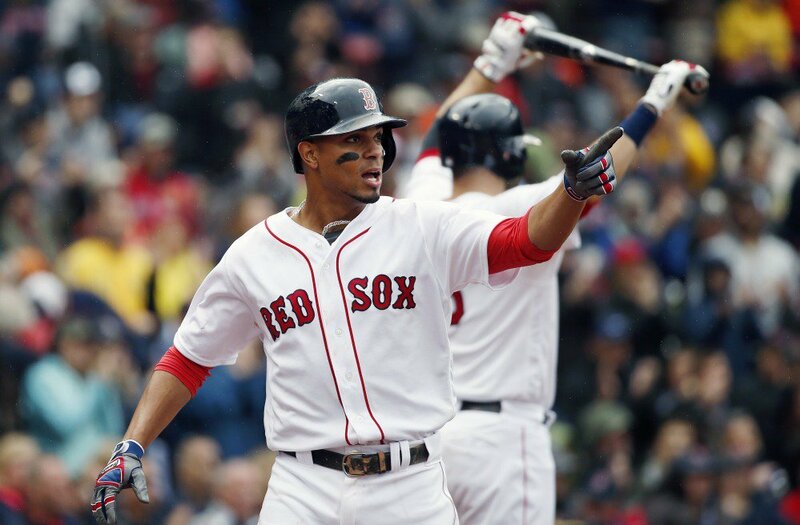 Bogaerts, of course, performed well in the 2013 playoffs, batting .296. Christian Vazquez (27) was a backup who didn’t get into last year’s playoffs, and this is obviously the first go for rookie Rafael Devers (20). Any of these six homegrown players can get hot. The more, the better for Boston’s sake. 2. Boston can hit homers despite what the statistics say (the Red Sox were last in the AL with 168 home runs, 70 fewer than Houston). Betts (24 homers), Hanley Ramirez (23), Mitch Moreland (22) and Benintendi (20) lead the Red Sox, and Devers leads the team with 10 homers in the second half of the season. Betts had a hot September with six home runs. In a tight game, one homer can make the difference. In 2013, Mike Napoli hit 23 home runs for Boston. He came up with a clutch one in the ALCS, homering off Verlander (see above) in a 1-0 win over the Detroit Tigers. 3. The Astros’ bullpen has holes. Boston ranked second in the league with a 3.15 ERA among its relievers. Houston ranked 10th with a 4.27 ERA. Closer Ken Giles (2.30 ERA), and fellow right-handers Chris Devenski (2.68) and Joe Musgrove (1.44) are dependable. After that, Houston could be in trouble. One wild card is former starter Francisco Liriano, a left-hander who hasn’t allowed a hit in his last six appearances. Boston’s bullpen, led by Craig Kimbrel, Addison Reed, David Price, Carson Smith and Joe Kelly, is a strength. 4. Baserunning seems to favor Boston. The Red Sox had a slight edge in stolen bases (106-98), but may run wild on the Astros, who ranked last in the majors in caught-stealing percentage (12 percent). Boston’s catching tandem of Vazquez and Sandy Leon was second in the majors (39 percent) at throwing out runners. Betts (26 of 29 on stolen base attempts), Benintendi (20 of 25) and Bogaerts (15 of 16) lead the Red Sox. Boston will not announce its roster until Thursday but if outfielder Rajai Davis makes it, look for him to pinch run. He was 29 of 36 this year, counting his time with Oakland. 5. Surpring contributions may make the difference for the Red Sox. That includes the offense provided by Vazquez, whose defense was always his strong point. He’s batting .290, 57 points above his career average. Brock Holt batted only .200 in an injury-plagued season but looks fine now and is getting hot (4 for 7 his last two games). Holt’s play at second base may be needed, depending on the availability of Dustin Pedroia and Eduardo Nunez, both hobbling with bum knees. Nunez, who has played only one game since Sept. 9, said he’s ready. That would be welcome news. Nunez hit .321 in 38 games since being acquired. He could DH or sub in for Devers against Keuchel. Deven Marrero entered this year with a .200 batting average. He still can’t hit right-handed pitching well but batted .291/.944 OPS against lefties. He should see time in the late innings, possibly as a pinch hitter, and as a defensive substitute. So the Red Sox have a chance. If the offense doesn’t vanish, it has the advantage.